Bike lanes are being added to Baronne Street by safety-vest wearing volunteers to demonstrate how bike lanes promote bike riding and bike safety as New Orleans hosts the 20th Walk Bike Places conference this week. The event runs through Wednesday at the Sheraton New Orleans Hotel on Canal Street and bring together more than 1,500 city planners, lawmakers and bicycling advocates from around the world who want to promote alternative means of transportation. Events including bike tours, debates, panel discussions and mobile workshops are planned. 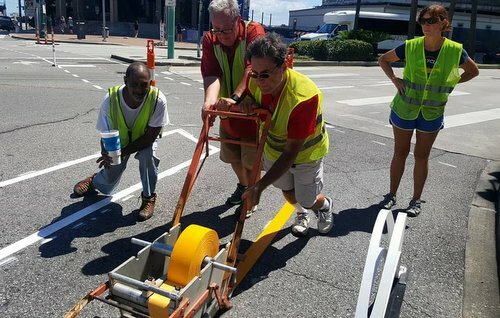 Downtown New Orleans streets are being painted with white lines and green blocks this week, to connect the existing bike lanes and provide a safer environment to cyclists. Look for the changes on Howard Avenue and Dryades, St. Louis and Basin streets. Holding the paint rollers all week are the volunteers of Bike Easy, an organization based in New Orleans that advocates biking in the city. To Dan Favre, director of Bike Easy, there is a direct link between bike lanes and safety for everyone on the road. As the paint dried this weekend on Baronne Street, cyclists were already riding the new bike lanes while cars passed by, kept at a distance by thick white lines. Susannah Halbrook rides her blue bike mostly for pleasure. “Whenever I’m not going to work, I’m pretty much on my bike,” she said. The absence of consistent bike lane citywide forces her to ride defensibly. “Even at times where I should have the right of way, I definitely take extra precautions because I know that drivers don’t always think I have the right of way,” she said. “Bike lanes make me a lot safer by giving me a designated space,” she said. The bike lanes painted by Bike Easy are supposed to last for three months, but organization members hope the lanes will remain. “I think there is a pretty good chance that this would then become permanent with the city taking it over,” said Isabel Barrios. The Loyola Student News Service features reporters from advanced-level journalism classes at Loyola University New Orleans, directed by faculty advisers.